After one month of consistent training, two students were promoted to White Belt 8th Kyu this morning. 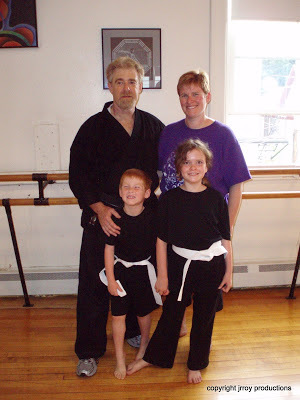 One from the Little Dragons on the left CT and his sister from the Youth Karate-Do program ST. Their mother to my left was (re)recognized as a 2nd degree Brown Belt which she earned as a teenager. This an extra special promotion for me as they are family: My sisters grand children and daughter, respectively.